If there's one Filipino snack that I didn't get to enjoy when I was little, it's Puto Pao. I was already in college when I first got to try it. They're so good and that made me wonder why my Nanay (mother) never made nor bought Puto Pao. So what is Puto Pao? 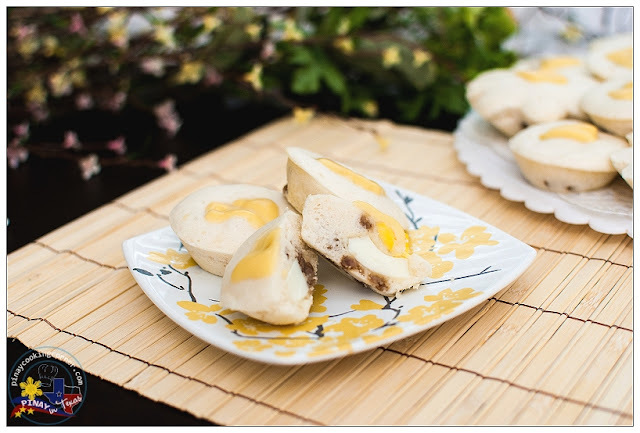 Well, it's a steamed rice cake like Puto with pork filling which makes it similar to Siopao. It is usually topped with slices of salted duck eggs and cheese. 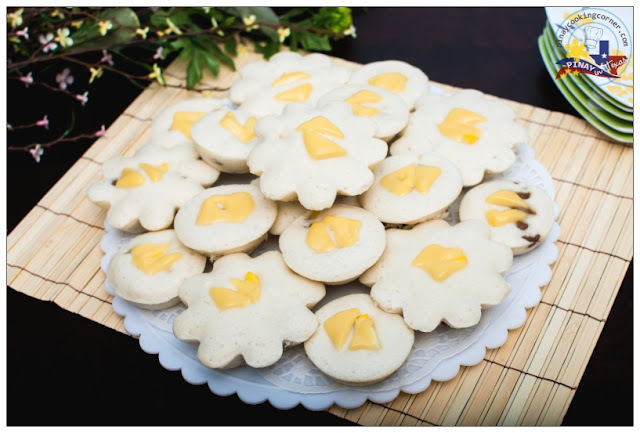 The hubs is a big fan of this yummy snack and so, making Puto Pao at home is a must. I've tried making it several times using the Puto recipe for the batter and the Asado Siopao filling recipe that I've posted before but the outcome was always not as spongy as the Puto Pao I remember eating back in the Philippines. 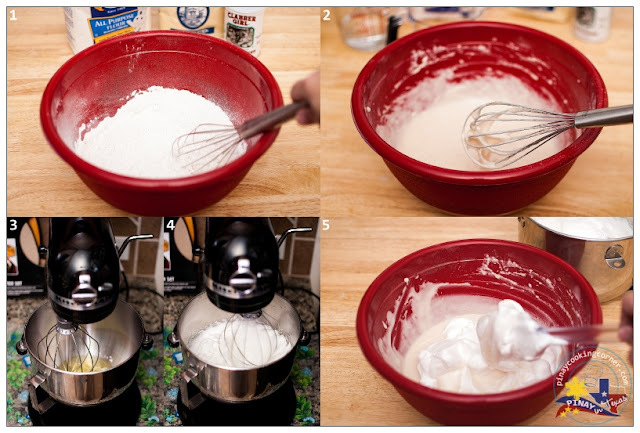 There's this recipe that I found at Pinoy Business Ideas which requires the use of egg whites in the batter. I tried that and the result was better. Though still not as spongy as I think it should be, it's better than the previous ones I made without egg whites and I believe is worth sharing. My daughters don't like salted duck eggs so I just used cheese for topping, and added slices of hard boiled eggs in the filling. Check out and try the recipe and let me know what you think! 1. 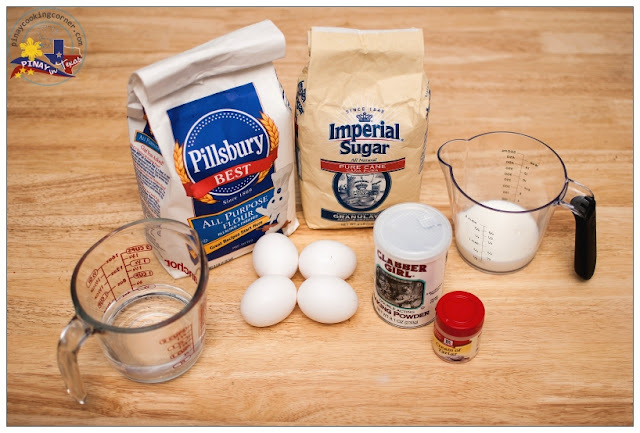 In a bowl, sift and mix flour, baking powder and 1/2 cup sugar. Add water and milk and mix until well combined and free of lumps. 2. In another bowl, beat egg whites and cream of tartar until soft peaks form. Add sugar gradually until stiff peaks form, and then fold into the batter. 1. Heat up olive oil in a saucepan over medium heat. Saute the garlic and onions until the onion is almost translucent. 2. Add the pork and stir-fry until light brown. 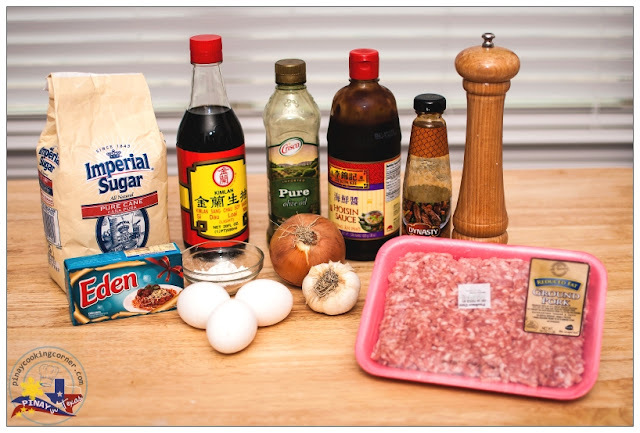 Add the soy sauce, oyster sauce, hoisin sauce, and sugar then mix well. Cover and simmer for 15 minutes or until pork is tender. 3. Add the cornstarch and mix until the sauce thickens. 4. Remove from heat and allow to cool down. Remove excess oil. 1. Prepare the steamer by filling it halfway with water and then add 1 Tbsp vinegar. (This will prevent the puto pao from turning yellowish.) Start heating up the steamer. Slightly grease puto molds. 2. Fill puto molds halfway with batter. 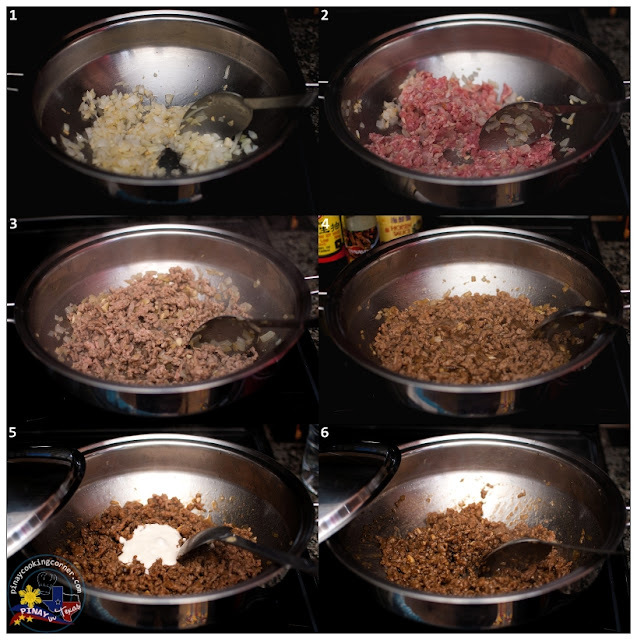 Top each with about 1 Tbsp Pork Asado filling and 1 slice of egg. 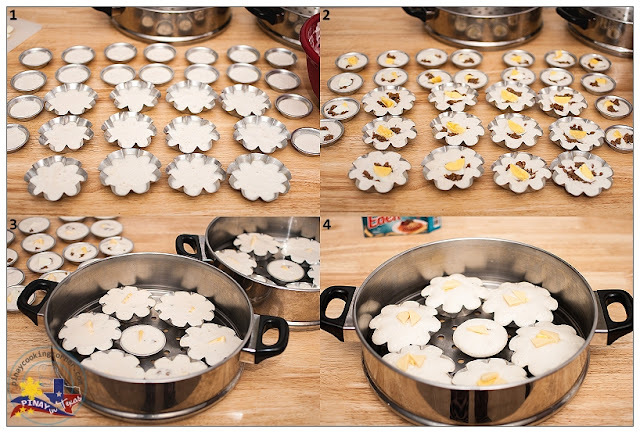 (For the small molds, I only used about half tablespoon filling). Add some more batter to each puto mold to cover the filling. 3. Arrange in steamer and steam for 15 minutes. Place cheesecloth in between each pan to avoid water drips. 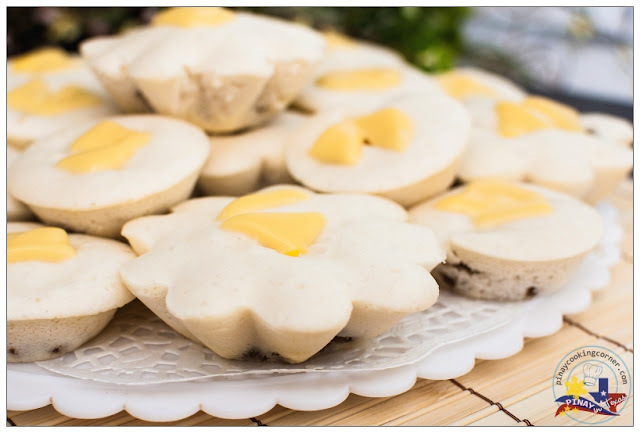 Remove steamer from heat and top puto pao with cheese. Steam for 3 more minutes. Remove from heat and allow to cool down. Remove from mold before serving. thanks for posting this recipe i will try to make one soon. . . i notice that you use eden cheese ,i live here in texas ,is there any asian store here that sells that? I finally made this yesterday! It was soooo good!!! My husband and the kids loved it. The puto was soft and spongy. I followed your recipe and adjusted it a little to my taste. Hi Tina. Been looking for this recipe. Puto pao is one of my fave snack back home. What is the correct flour to use. AP or cake flour.? Coz i noticed that in your ingredients list, you wrote AP but in the procedure you said cake flour. Thank you. Thanks for that! It's all-purpose flour. i love your recipes..they are tested unlike other blogs. i think they are not posting the exact measurements.. thanks tina.